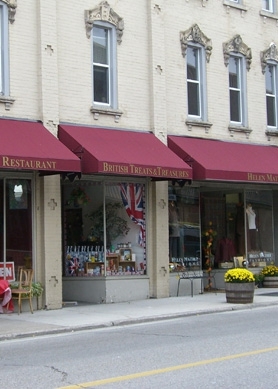 A number of factors determine the pricing of an awning. 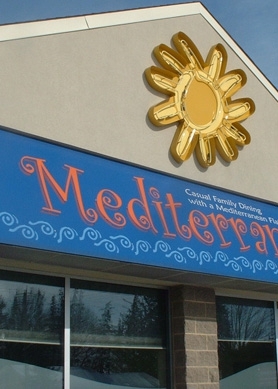 We manufacture several different styles of awnings, some fairly basic, some with wind-resistant arms, some motorized, and even some with remote control. We also manufacture a myriad of sizes for various applications. 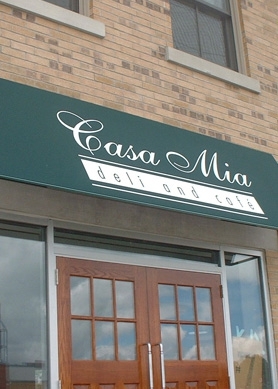 Your awning will be custom-manufactured to meet your needs. So invite us out to your home to enable us to give you the information and pricing you require. As a national manufacturer, we can make virtually any size you require. Our maximum projection out from the building is 13', the largest projection on the market. 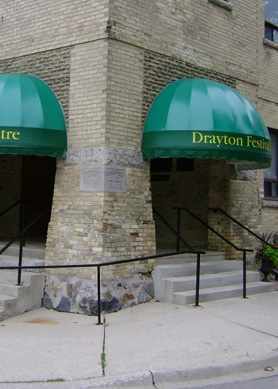 Your awning can be made any width along the building you desire. MacDonald Awning carries a minimum five year warranty. This includes the hardware, fabric, and motorization, if so equipped. 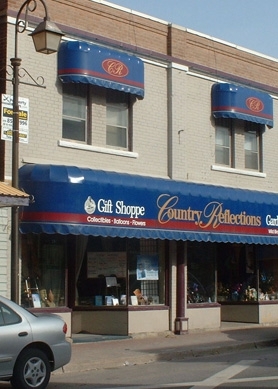 How are the awnings attached to the building? 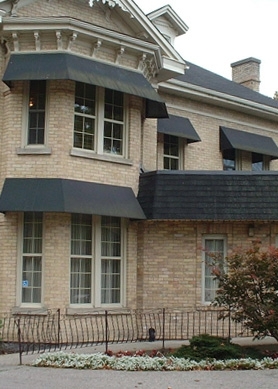 We can mount your awning onto brick, aluminum siding, under soffits, even in front of the eavestroughing. 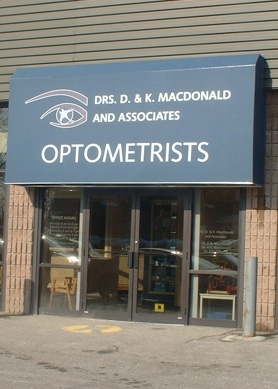 Unlike other companies, we try to keep your awning off the roof. Can you tell me about the fabric? 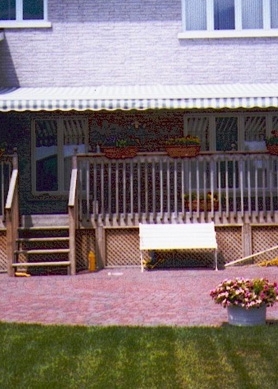 The fabric that we use to manufacture our awnings, unless otherwise specified, is a solution-dyed acrylic material. Unlike cottons or canvas, this acrylic is resistant to rot, mould, and mildew. This tightly woven fabric is 98-99% UV and water-resistant. There is a five year warranty on the fabric, but you should expect many more years of service from this material. Can my awning be motorized? A motor can be used to send your awning out and to retract it back in. A hand-held remote control or an outdoor switch in a weatherproof box may be used. 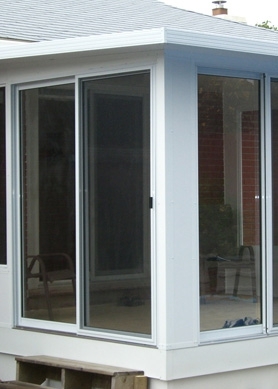 You may also opt for an indoor switch to be installed right beside your patio door. With either switch you select, you will be the envy of your neighbourhood. Can I add a motor later? We strongly recommend you have the motor installed when you order your awning, as the labour involved with removing the awning, returning it to our shop, installing the motor, and re-installing the awning at your home will be very costly, not to mention inconvenient to you. I've decided what awning and options I want. How soon will my awning be ready? 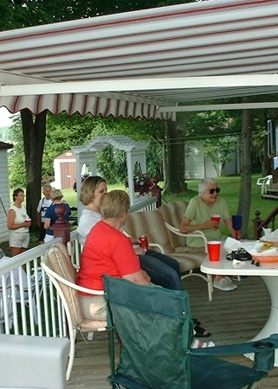 We will do our best to have your awning installed withing three weeks of your order being placed. This time period may be greater or less, depending on the availability of your fabric colour choice, and whether it is 'peak' awning season. What separates MacDonald Awning from the rest? We take pride in using strong steel back bars, heavy duty cast mounting brackets and the most durable powder coated arms and front bars. 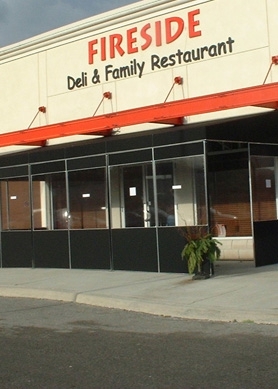 A patented wind lock feature makes MacDonald Awning stand apart from the rest. We combine these features and more into the sleekest and most attractive unit on the market. Simply visit our showroom, call or email us to arrange an in-home estimate and you will see why MacDonald Awning are the best under the sun.